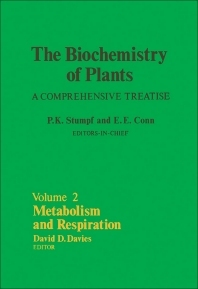 The Biochemistry of Plants: A Comprehensive Treatise, Volume 2: Metabolism and Respiration is a collection of articles that is largely concerned with the area of intermediary metabolism. This volume contains papers that discuss topics on the production of active C1 groups, photorespiration and the effect of light on respiration. Respiration and related metabolic activity in wounded and infected tissues, the respiration and senescence of plant organs, the effect of temperature on respiration and the assessment of the contributions of metabolic pathways to plant respiration are likewise covered. Biochemists and botanists will find the book highly useful.